Ariana Allen | The PHOENIX First-year setter Garrett Zolg was named MIVA Freshman of the Year after talling 10.46 assists per set and 2.1 digs per set this season. 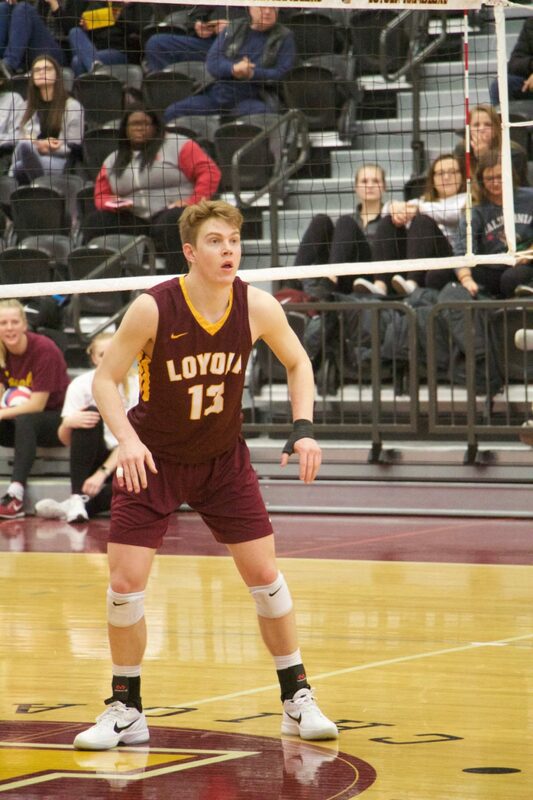 Loyola men’s volleyball coach Mark Hulse was named Midwestern Intercollegiate Volleyball Association (MIVA) Coach of the Year, the conference announced today. First-year setter Garrett Zolg picked up first team All-MIVA honors and was named MIVA Freshman of the Year. Senior opposite Ricky Gevis, senior middle blocker Jeff Jendryk and junior outside hitter Collin Mahan were also named first team All-MIVA. In his third season as head coach, Hulse led the Ramblers to a 21-6 overall record, including an 11-3 conference record to finish tied for first in the MIVA standings. Hulse is the first Loyola coach to win Coach of the Year since his predecessor, Shane Davis, won in 2014. Zolg, out of Santa Ana, California, ranked second in MIVA with 10.46 assists per set while also adding 2.1 digs per set. He’s the first Rambler to win Freshman of the Year since Thomas Jaeschke in 2013. The Ramblers are scheduled to open the MIVA Tournament against Lindenwood University April 14 at 7 p.m. at Gentile Arena.